In the beginning there was nothingness- the absence of substance and form (Ain) ; and as the nothing became aware of itself it also realized the limitlessness nature (Ain Soph) of its being. This realization expanded and with more awareness came the birthing of limitless light (Ain Soph Aur) . This limitless light felt the urge to create- and from it emanated Divine Intelligence – Kether. All things needing balance- in its wisdom Kether split and from this source of being the remaining 9 spheres became emanations of the varied permutations of light, knowledge, mercy, severity, beauty, love, glory, imagination and finally rest in the Kingdom of Earth- Malkuth. The subject matter of the Qabalah is one that many pagans do not easily gravitate towards, either deterred by the sheer mass of its scope or feeling that this particular overlay of system has no reference to the purely magickal systems. Although, rooted in the Judaic mystical system the Kabbalah(spelling is Judaic form)/Qabalah (spelling used to distinguish as Western Hermetic overlay) this construct of energy, thought and working is a suitable companion to any magickal system. The sheer fact that a statement such as that can be made offers testament to the enduring scope and permanence of its application over a broad and diverse spectrum. Within the Tradition to which I belong, The Assembly of the Sacred Wheel, the principles of the Qabalah are strongly and consistently used throughout all of our covens and the enhancement to the magickal workings and rituals is undeniable. 4 Worlds of Action– Each of the spheres exists in each of the four worlds and has a slightly different emphasis of intent depending on which of the worlds is acting upon it. The Sephiroth are States of Being and act as vessels to contain the Divine energy that spills forth from the God-Head or Crown of Kether (being the highest expression of the Divine) down into Malkuth, the densest and manifest physical world of Man. The spheres at the top of the tree are lighter and finer in energy – more transparent and expressive of pure Light. 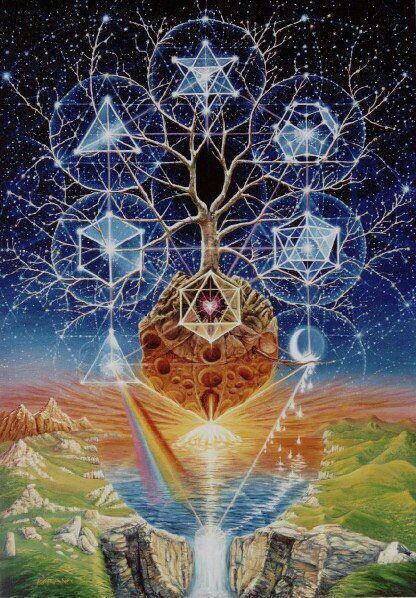 As we descend down the tree each sphere gains more density- less clarity of brilliance of light until we come to rest in the earth plane of Malkuth. Each sphere has both an English and Hebrew name and countless correspondences attributed to each. These are keywords only. This is a poem I wrote about the energy of the sphere of Geburah and gives a hint to the potency and dynamics of this sphere. Lose my most valued possession. Have yet to be opened. Excision sends me into retreat. I rise from this place of cowering. In the months ahead, I’ll post more about the spheres and some specifics of correspondence relevant to each. Reflect a little on the brief glimpse I’ve given for now..
© Robin Fennelly and Qabalistic Journeys, 2018. Unauthorized use and/or duplication of this material without express and written permission from this blog’s author and/or owner is strictly prohibited. Excerpts and links may be used, provided that full and clear credit is given to Robin Fennelly and Qabalistic Journeys with appropriate and specific direction to the original content.